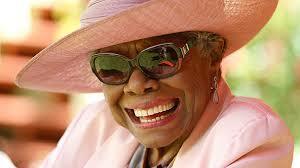 Our Phenomenal Literary Icon, Dr. Maya Angelou has ascended to the heavens. Her beautiful spirit remains near and dear to our hearts. Each of us must utilize the messages emparted by her to enrich our lives and the lives of others. She was a gift to us, now we must use the nuggets of knowledge that she provided, to spring forth a new beginning to correct our paths and proceed towards what was meant for each of us. Although we feel sadness, we must remember to rejoice for the heavens have truly welcomed home a dear angel.